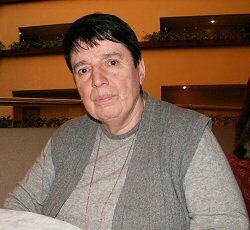 There is no need to introduce Nona Gaprindashvili: her name is well-known not only for chess lovers. The whole epoch of Soviet and Georgian chess school is connected with her name. During the champion championship the honor guest easily agreed to long-expected interview. You are very popular, indeed, not only in Georgia but also all over the world. How have you achieved such great results? When during 40 years you are always on the top of success, you show the game and achieve results, you become respected. It is the best award for me. And how did chess differ 40 years ago? It was enthusiasm that helped you, wasn’t it? Why haven’t you taken part in this championship? You see, I’m 65, it’s quite enough. I had been playing for a long time (laughing). I have never kept silence about my age. Everybody knows when my birthday is – it was written about so many times – why should it be a secret? It doesn’t disturb me. Last year, for example, was very exciting. I was about to win the Men’s World Championship among veterans. And do you know who plays among veterans, how strong they are! I was about to win, but I lost my position to Bulgarian chess player Spasov, who became the world champion. So that, if is possible I take part in tournaments but just for pleasure. Of course, it doesn’t happen without emotions even now, but these are positive emotions. Does difficult economical situation influence the sport? Undoubtedly. No sooner has a talented sportsmen appeared than he is sold or he leaves abroad himself. It is true. Sport needs special conditions. Our republic is small – there are a lot of objective and subjective problems there: economy is not on a high level now, that is why we don’t have such conditions. Nothing will develop without strong economy. By the way, speaking about the past of the chess, Soviet system is successfully used in China. As for you, is chess a spectacular kind of sport? Chess is a long game and there must be complete silence in the playing area. There can’t be crowds of people as in the stadium. Instead, chess can be seen over the Internet by thousands of people. You see, I remember those days when a lot of people gathered in theatres, in large halls, the games even transmitted on large screens for those who couldn’t get inside. It was great! Now they are sitting by computers, competing, playing blitz, etc. So that chess has its own audience. How did you become the president of Georgia Olympic Committee? It happened after Soviet Union disintegration. They needed somebody to become the president. I can tell you it is a really difficult work. I was the first president and I have worked for 8 years. Then I left this post myself. The reason was the same – I saw so much dirt during the Olympic Games. I was shocked very much, especially when somebody wrongly rises on pedestal. At that moment I said: “What’s happiness that I have chosen the sport when everything depends on you, even an arbiter as well as anybody can do nothing”. I refused from such struggle. Olympic movement has always been my ideal – it is the beginning of the sport history. Unfortunately, not everybody understand it. I faced it myself. 8 years is not a short period. I have experienced so much during that period. I just wanted to have rest, to have good nights rest at last. That is why I became the honor president and I am quite satisfied as my life is devoted to sport. You often visit The Urals. What does this place mean for you? I wasn’t able to visit this place when I played chess actively. And now I have enough time and I willingly participate in veteran tournaments. I visited Chelyabinsk, Ekaterinburg, Krasnoturiinsk. What does this place mean for me? You see, there is no unsuitable city for me. I am a happy person, first of all because I am always valued and warmly received. No any politic problems can become obstacle for communication and sport. No matter where we live. The main thing is what we give to this world. There are bad people, but there are no bad nations. Though the relationships between the countries are strained, culture and sport are those spheres where communication continues and never stops. That is why every time I am invited I always try to arrive if my health allows. I never regretted. And this time I am very pleased to be here as the representative of FIDE President Kirsan Ilumzhinov. How do you estimate the organization of the championship? The organization is always good in Russia. We all knew that it’ll be good. Perhaps, something should be changed in Regulation of the championship. Every system has its own advantages and disadvantages. Time corrects. When I played, the chess games were solid and there were fewer incidents. Who is you personal favorite? Gallyamova. I have always considered her to be the excellent chess player. Once she played with Se Zun (?). Alisa was equal with her, she could even win. Then she suddenly got lost. She did not play for several years. And now we are watching her rise. I am very happy for her. She will show how to play. It is politics, just politics… I don’t justify anybody – neither Georgia nor Russia. The both sides are guilty. It mustn’t be so. It becomes funny when I have to apply for visa to get to Russia. Can you imagine this? These are two friendly Christian countries. We have to support each other and our nations would like to live in peace. How many Georgians are there in Russia? And how many Russians are there in Georgia? Nobody leaves our country for national reasons – only for economical reasons. We are neighbors, but politicians can’t reach the arrangement. I don’t think it will last for a long time. We would like to improve our relationships. Will women catch up with men in chess? It is impossible because men have their height and women theirs. The female leading chess players successfully fight with men, but on high rank tournaments it is really difficult. I was among the first who tried to prove that women who play good chess may compete with them. Of course, it is difficult as a man is a winner by nature. They born with alertness and fighting skills, but women have to develop these skills. Chess is as energy consuming as no other kind of sport. That is why women recover slowly – the tension is great. Even while sleeping we think of moves and combinations. Physical and psychological works are connected and in this case men are stronger than women. Women are emotional. Besides, women deliver babies and it is impossible to switch off the mind and forget about your child. How many points have I mentioned? When a woman plays with a man, the latter has great advantage. That is why when a woman achieves great results it is twice valued. That is why they can be compared in qualitative and not quantitative ratio. What do you think about further chess trends? Of course, computers will do the best, but they will never change a human being. In my generation every Grand Mater was a personality. Modern computer programs are the result of work of such people. Anyway, people have to communicate more. As Ekzuperi once said: “The only treasure I know is the treasure of human communication”.